Denise always wanted to work as a veterinary nurse. She has had animals her whole life as a result of her great love for them. Working in the veterinary industry was a natural progression for her. Denise has extensive veterinary experience. 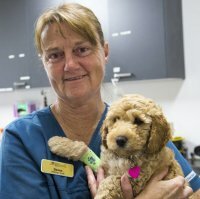 She worked in Perth for 6 years as a Head Nurse. Then followed 12 years as a Nurse and Practice Manager in Noosa. She is now an emergency and critical care nurse with our Tanawha practice on the Sunshine Coast.